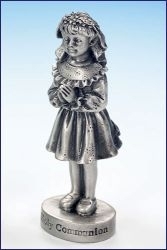 This First Communion figurine is made from pewter and comes in a gift box shaped like a book. This would make a very nice remembrance gift for Communion girls. NOTE: See the Photos tab above for pictures of the outside and inside of the gift box.